It’s 2am. You receive a notification from your monitoring tool. A host server ran out of space and your system is down. Now you need to get out of bed and clear the log files of whatever service has filled up your available disk space. Ugh. Now, imagine that an automated action is triggered, the log files are cleared, and your system is up and running again without requiring a single thing from you. Sounds cool, right? Well, that’s exactly what AlarmsOne’s new Auto-remediation feature does for you. Auto-remediation is a self-healing process in which an incident is prevented or fixed by automatically executing defined scripts or actions when an alert is received. All you need to do is install an agent on your system, define the alert criteria that will initiate an action, and design the auto-remediation action to be executed. You can even write a script for one auto-remeditation action and use it again down the line. More than one script can be triggered in an instance and multiple actions can be performed as well. In the above example, when a critical alert related to low disk space is triggered, AlarmsOne runs a script to delete log files that are more than two days old. You can define the maximum frequency (instances per minute) at which scripts should be executed. AlarmsOne also allows you to email a report about an auto-remediation action to your contacts and schedules. 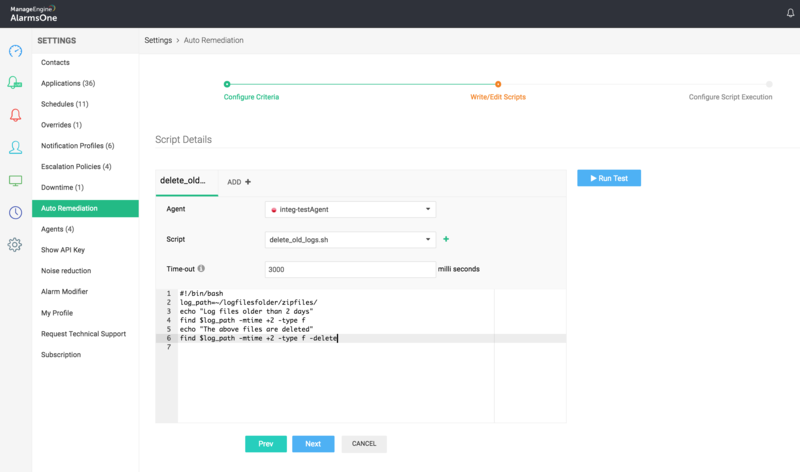 With this new feature, you can automatically remediate incidents and accelerate your workflow. To try auto-remediation now, sign in to your account and go to Settings > Auto-remediation and click Add. 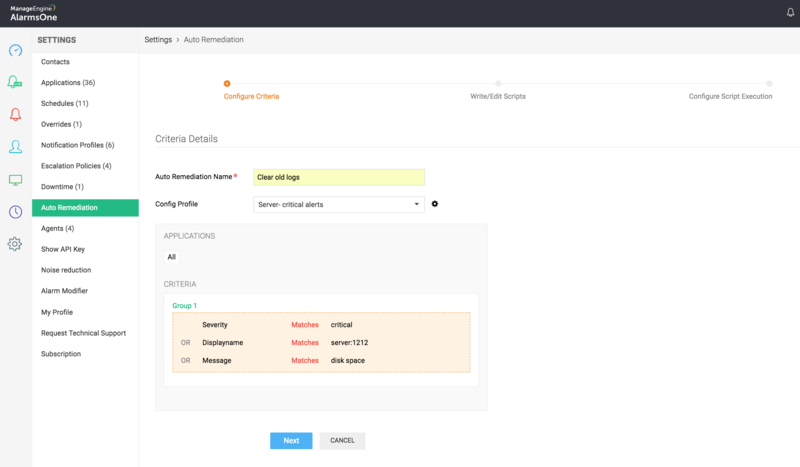 If you’re new to AlarmsOne, click here to create your account and automate your incident management process.